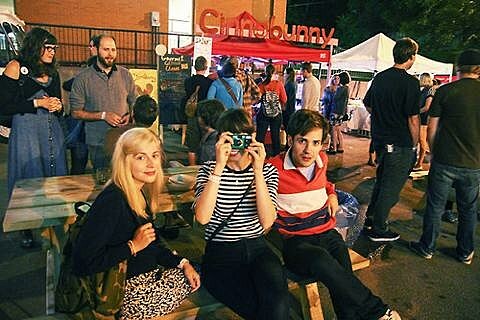 Toronto group Alvvays is the project from Molly Rankin who is decended from Canadian folk royalty and made a record under her own name a couple years ago. Despite Rankin’s family background, Alvvays make wistful, jangly, Brit-tinged indiepop. You can stream a couple tracks, and check out the video for terrific single “Adult Diversion,” below. The band are currently finishing their debut album with producer Chad Vangaalen (John Agnello is doing the mix) and you can look for that via Royal Mountain Records (Hollerado, Pup) early next year. Alvvays are currently on a Canadian tour but will dip into the States for two NYC shows this month: Mercury Lounge on 11/25 with Honey Wild, Hippy, and The Sanctuaries; and 11/26 at Glasslands with Jacksie and BOYTOY. Tickets to both Mercury Lounge and Glasslands are on sale now. All dates are listed, along with video and streams, below.